The 18-hole Arnold Palmer Course at St. Andrews Country Club in Boca Raton, FL is a private golf course that opened in 2003. Designed by Arnold Palmer and Ted McAnlis, Arnold Palmer Course at St. 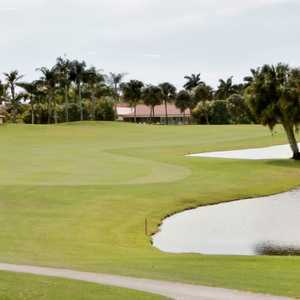 The 18-hole Boca Dunes Golf & Country Club in Boca Raton, FL is a semi-private golf course that opened in 1970. Designed by Bruce Devlin and Robert von Hagge, Boca Dunes Golf & Country Club measures 6536 yards from the longest tees and has a slope rating of 129 and a 72 USGA rating. The 18-hole Boca Greens Country Club in Boca Raton, FL is a private golf course that opened in 1979. Designed by Joe Lee, Boca Greens Country Club measures 7026 yards from the longest tees. The greens are tif-eagle and the fairways are tif-way 419 bermuda. The 18-hole Boca Grove Golf Course in Boca Raton, FL is a private golf course that opened in 1982. Designed by Karl Litten, Boca Grove Golf Course measures 6808 yards from the longest tees . The course features 6 sets of tees for different skill levels. The greens are bermuda grass. The 18-hole Boca Rio Golf Club in Boca Raton, FL is a private golf course that opened in 1967. Designed by Robert von Hagge, Boca Rio Golf Club measures 7116 yards from the longest tees and has a slope rating of 138 and a 74. The 18-hole Bocaire Country Club in Boca Raton, FL is a private golf course that opened in 1984. Designed by Joe Lee, Bocaire Country Club measures 6795 yards from the longest tees and has a slope rating of 139 and a 73. The 18-hole Championship at Boca Raton Municipal Golf Course in Boca Raton, FL is a public golf course that opened in 1982. Designed by Charles Ankrom, Championship at Boca Raton Municipal Golf Course measures 6714 yards from the longest tees and has a slope rating of 131 and a 71. The 18-hole Club Course at The Polo Club of Boca Raton in Boca Raton, FL is a private golf course that opened in 2002. Designed by Karl Litten, Club Course at The Polo Club of Boca Raton measures 6829 yards from the longest tees. The 18-hole Country Club Course at Boca Raton Resort & Club in Boca Raton, FL is a resort golf course that opened in 1985. Designed by Joe Lee, Country Club Course at Boca Raton Resort & Club measures 6714 yards from the longest tees and has a slope rating of 141 and a 73 USGA rating. The 9-hole East Course at Boca Lago Country Club in Boca Raton, FL is a private golf course that opened in 1975 and was designed by Bruce Devlin and Robert von Hagge. The course features 5 sets of tees for different skill levels. Greens and fairways are bermuda grass. The 18-hole East/South at Ocean Breeze Golf & Country Club in Boca Raton, FL is a semi-private golf course that opened in 1968. Designed by Charles Mahannah, Jr. and Mark Mahannah, East/South at Ocean Breeze Golf & Country Club measures 6609 yards from the longest tees and has a slope rating of 116 and a 68. The 18-hole Equestrian Course at The Polo Club of Boca Raton in Boca Raton, FL is a private golf course that opened in 1985. Designed by Karl Litten, Equestrian Course at The Polo Club of Boca Raton measures 7012 yards from the longest tees. 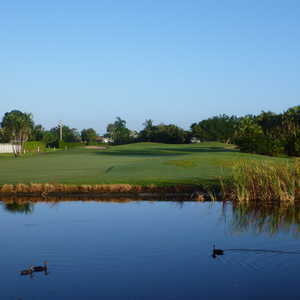 The 9-hole Executive at Boca Raton Municipal Golf Course in Boca Raton, FL is a public golf course that opened in 1982. Designed by Charles Ankrom, Executive at Boca Raton Municipal Golf Course measures 1877 yards from the longest tees. The course features 3 sets of tees for different skill levels. The 18-hole Fazio II Course at St. Andrews Country Club (formerly known as Gene Bates Course at St. Andrews Country Club and St. Andrews Country Club - Olde Course) in Boca Raton, FL is a private golf course that opened in 1986. The 18-hole Lakes Course at Boca Woods Country Club in Boca Raton, FL is a private golf course that opened in 1985. Designed by Karl Litten, Lakes Course at Boca Woods Country Club measures 6816 yards from the longest tees and has a slope rating of 143 and a 73. The 18-hole New Course at Broken Sound Club in Boca Raton, FL is a private golf course that opened in 1985. Designed by Joe Lee, New Course at Broken Sound Club measures 7025 yards from the longest tees and has a slope rating of 147 and a 74. The 18-hole North/East at Ocean Breeze Golf & Country Club in Boca Raton, FL is a semi-private golf course that opened in 1968. Designed by Charles Mahannah, Jr. and Mark Mahannah, North/East at Ocean Breeze Golf & Country Club measures 6609 yards from the longest tees and has a slope rating of 124 and a 71. The 18-hole Old Course at Broken Sound Club in Boca Raton, FL is a private golf course that opened in 1978. Old Course at Broken Sound Club measures 6906 yards from the longest tees. The 9-hole Red Reef Executive Golf Course in Boca Raton, FL is a public golf course that opened in 1957. Designed by Joe Palloka, Red Reef Executive Golf Course measures 1357 yards from the longest tees. The greens are bent grass. The 18-hole Resort Course at Boca Raton Resort & Club in Boca Raton, FL is a resort golf course that opened in 1926. Designed by Howard C. Toomey and William S. Flynn, Resort Course at Boca Raton Resort & Club measures 6253 yards from the longest tees and has a slope rating of 130 and a 69. The 18-hole Royal Palm Yacht & Country Club in Boca Raton, FL is a private golf course that opened in 1959. Designed by Robert Trent Jones, Sr. , Royal Palm Yacht & Country Club measures 7116 yards from the longest tees and has a slope rating of 141 and a 75. The 9-hole South Course at Boca Lago Country Club in Boca Raton, FL is a private golf course that opened in 1975 and was designed by Bruce Devlin and Robert von Hagge. The course features 5 sets of tees for different skill levels. Greens and fairways are bermuda grass. The 18-hole South/North at Ocean Breeze Golf & Country Club in Boca Raton, FL is a semi-private golf course that opened in 1968. Designed by Charles Mahannah, Jr. and Mark Mahannah, South/North at Ocean Breeze Golf & Country Club measures 6483 yards from the longest tees and has a slope rating of 122 and a 70. 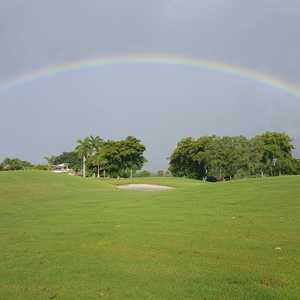 The 18-hole Southwinds Golf Course in Boca Raton, FL is a public golf course that opened in 1977. Southwinds Golf Course measures 6018 yards from the longest tees and has a slope rating of 127 and a 68. The 18-hole Stonebridge Golf & Country Club in Boca Raton, FL is a private golf course that opened in 1985. Designed by Karl Litten, Stonebridge Golf & Country Club measures 7006 yards from the longest tees and has a slope rating of 147 and a 74. The 18-hole The Club at Boca Pointe in Boca Raton, FL is a private golf course that opened in 1981. Designed by Bob Cupp and Jay Morrish, The Club at Boca Pointe measures 6876 yards from the longest tees. The course features 5 sets of tees for different skill levels. The 18-hole Via Mizner Golf & City Club (formerly known as Boca Del Mar Country Club) in Boca Raton, FL is a private golf course that opened in 1972. Designed by Bruce Devlin and Robert von Hagge, Via Mizner Golf & City Club measures 6144 yards from the longest tees and has a slope rating of 131 and a 70. The 9-hole West Course at Boca Lago Country Club in Boca Raton, FL is a private golf course that opened in 1975 and was designed by Bruce Devlin and Robert von Hagge. The course features 5 sets of tees for different skill levels. Greens and fairways are bermuda grass. The 18-hole Woodfield Country Club in Boca Raton, FL is a private golf course that opened in 1988. Designed by Joe Lee, Woodfield Country Club measures 7115 yards from the longest tees and has a slope rating of 142 and a 75.2 USGA rating. The course features 5 sets of tees for different skill levels. The 18-hole Woods Course at Boca Woods Country Club in Boca Raton, FL is a private golf course that opened in 1985. Designed by Joe Lee, Woods Course at Boca Woods Country Club measures 6647 yards from the longest tees and has a slope rating of 141 and a 72.